Epson TM-H6000II - Thermal/Impact multifunction printer, has power supply, USB interface, two-color order printing, no MICR and endorsement. Color: Dark gray. The High-speed TM-H6000ii scans and captures checks at the point of sale all in a single step and cuts transaction time in half. 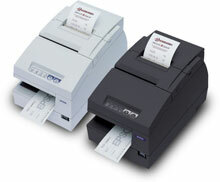 The Epson C31C411A7850 is also known as Epson POS Products	EPS-C31C411A7850	.